Slow travel is the latest eco-buzzword. By using slower forms of transport, you are can not only reduce your carbon footprint, but also make the journey a feature of your break. Walking is about as slow as it gets. And in terms of ethical travel, if you use a local guide as you walk, stop in small rural hostelries or hotels en route, and shop off the beaten track, you are ticking lots of responsible tourist boxes as you go. So if you started the New Year walking off festive excesses along your nearby beach, or up a local mountain, you are off to a good start. For walking breaks in Ireland, check out The Irish Times’ Go’s regular walking features as well as www.walkireland.ie, which provides details of Ireland’s Waymarked Ways. At present, there are 31 of these trails, covering almost 3000kms. The website divides them into different sections, giving guidance on levels of difficulty on each walk. You can also order, or download, a copy of their “Selected Day Walks” leaflet for shorter strolls. 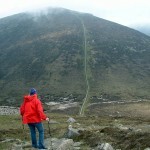 Northern Ireland’s www.walkni.com covers similar trails north of the border, and has an excellent “getting to and from the walk” section, with public transport options for accessing each of their walks. Two of my favourites short walking breaks in Ireland are at Tawnylust Lodge in Leitrim and Gregans Castle Hotel in The Burren. The former is owned by keen hill walker and local guide Nuala McNulty, Staying in her eco-friendly wooden lodge overlooking the North Leitrim Glens, she not only tailors walks to suit visitors’ needs, but also runs guided walking weekend breaks, called ‘Leitrim Landscapes’, from Spring flower walks in May to mushroom foraging in August (www.tawnylustlodge.com). From Gregans you can explore the wonders of the Burren with the help of their neighbour, Shane Connolly, a local walking guide, archaeologist, historian and farmer, who offers daily walking tours for guests (www.gregans.ie). Take your hiking boots to Scotland or Wales for very different landscapes, all easily accessible using ferries and trains. Upland Escapes, a company with exemplary responsible tourism policies, offers walking holidays to the glorious peaks of Snowdonia, just a hike, skip and a jump across the Irish Sea (www.uplandescapes.com). In Scotland it’s hard to beat Wilderness Scotland for its range of walking holidays. Taking the slow route also makes you appreciate just how far away these isles and lochs really are. For example, you can take the ferry to Stranraer, train to Glasgow, and another sleeper train to Inverness for one of their summer walking breaks in The Hebrides. Or, take on the snowy Cairngorms on one of their winter walking trips, recommended for fit summer walkers who want to have a go with ice axes and crampons (www.wildernessscotland.com). For walking holidays further afield, there is a plethora of companies out there. To walk the cliffs, coasts and coves of Madeira see www.adventurecompany.co.uk. Roam in rural Romania with InnTravel, just one of 99 trails offered by this 25-year old multi-award winning walking company (www.inntravel.co.uk), or take on the Turkish coastline where the Mediterranean hardly ever leaves your sightline on a guided walking holiday along its ancient Lycian Way (www.exclusiveescapes.co.uk). To walk along shepherds’ trails in the Julian Alps in Slovenia see www.intrepidtravel.com, or to trek through the Tatras Mountains in Slovakia, from €450 (including flights from Dublin) see www.mountainparadise.co.uk. All the above companies have highly regarded responsible tourism policies, years of experience and local conservation knowledge. So if you want to slow down in 2009, consider the words of US novelist Louis L’Amour: “The trail is the thing, not the end of the trail. Travel too fast and you miss all you are travelling for”. This entry was posted in Articles and tagged adventure company, exclusive escapes, gregans, inntravel, intrepid travel, slow travel, tawnylust, upland escapes, walkireland, walkni, wilderness scotland. Bookmark the permalink.